The Bosch line of step drills offers the ability to drill up to 13 different size holes with a single bit. 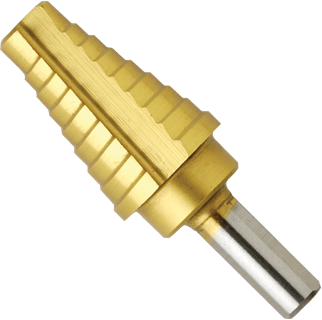 Step drill bits are ideal for electrical, plumbing and HVAC contractors. Titamium-coated step drill bits remain clean and accurate even in the toughest materials; superior durability that lasts up to six times longer life than high-speed steel.